We are both perplexed as to the sign’s possible meaning. Is the proprietor advertising that Lady Gaga music is available inside? 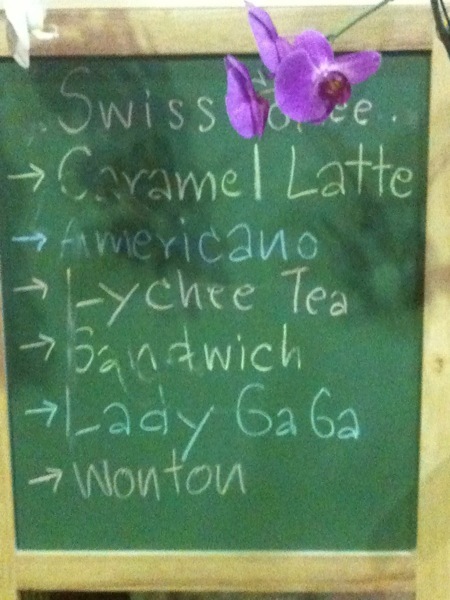 Or is the Lady Gaga some sort of coffee drink? What kind of cafe has wontons? Any guesses are welcome. Leave a comment below. Previous posts about interesting Thai signs are here (another spotted by A) and here. Posted byNewley April 8, 2011 April 8, 2011 Posted inMisc.